MOGADISHU – The African Union Mission in Somalia has a new Force Commander. 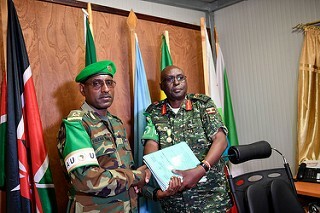 Lt. Gen. Tigabu Yilma Wondimhunegn, from Ethiopia, took up office on Thursday 31, from Lt. Gen. Jim Besigye Owoyesigire, who has served in that capacity since January 2018. “There is work to be done,” Ambassador Madeira told Gen. Tigabu during the handover ceremony. “The task ahead is enormous, but I am very confident that you can do it,” he added while commending Gen. Owoyesigire for “sharing all his knowledge” to push forward AMISOM’s mandate. He described the outgoing Force Commander as an “extraordinary officer”. Gen. Tigabu has 34-years’ experience in the military and has served the Ethiopia National Defence Forces (ENDF) in several capacities, including as Division, Brigade, Battalion, and Company Commander.